Wine is considered kosher when produced according to Judaism's religious dietary laws (kashrut) pertaining to the wine-making process. (Note: some non-Orthodox branches of Judaism may be more "lenient" in their classification of kosher wine). When kosher wine is produced, marketed, and sold commercially to Orthodox Jews, it requires the hekhsher ("seal of approval") of a supervising agency or organization (such as the "OU" sign of the Orthodox Union) or of an authoritative rabbi/posek ("decisor" of Jewish law). Alternatively, kosher wine may be supervised by a beth din ("Jewish religious court of law") according to Orthodox Judaism. In general, kashrut deals with avoiding specific forbidden ingredients, none of which are normally used in wine-making, so it might seem that all wines are automatically "kosher." Nevertheless, the laws governing kosher wine are largely concerned with the individuals in charge of handling the wine throughout the wine-making process. To be considered kosher, a Sabbath-observant Jew must be involved in the entire wine-making process, from the time of harvest to the actual bottling. Additionally, because of wine's special role in many non-Jewish religions, the kashrut laws specify that wine cannot be considered kosher if it might have been used for "idolatry" purposes. These laws include both Yayin Nesekh (wine that has been poured to an idol) and Stam Yenam (wine that has either been touched by someone who believes in idolatry or produced by non-Jews). When kosher wine is mevushal ("cooked" or boiled"), it becomes unfit for idolatrous use and will thereby keep the status of kosher wine even if subsequently touched by an idolater. 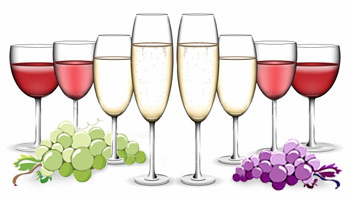 This style of wine is frequently employed by kosher restaurants and caterers. In the past, the actual boiling process tended to kill most of the fine mold or "must" on the grapes, and greatly altered the tannins and flavors of the wine. In recent years, the process was modified to require only that wine be heated to 194F (90C). (At this temperature, the wine is cooking, not bubbling, in the sense that it will evaporate much more quickly than usual.) This modification managed to reduce some of the damage done to the wine, but still had a substantial effect on its quality and aging potential. Recently, a process called flash pasteurization has come into vogue. This method avoids causing the juice of the grapes to simmer or boil, and is said to have a minimal effect on flavor, at least to the casual wine drinker. Indeed, the non-kosher winery, Château Beaucastel, utilizes flash pasteurization and its wines are considered among the world's finest, although few others have copied this technique. In most territories, the bulk of kosher wine is supplied by wineries producing both kosher wine and non-kosher wine. Irrespective of the method, however, the pasteurization process must be overseen by mashgihim (religious "supervisors") to ensure the kosher status of the wine. Generally, they will attend the winery to physically tip the fruit into the crush and operate the pasteurization equipment. Once the wine emerges from the process, it can be handled and aged in the normal fashion.